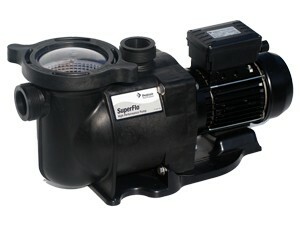 The SuperFlo Pumps are specifically designed to be the best choice for a variety of inground pools. SuperFlo features thick walled body parts, a heavy-duty 56 square flange motor, and highly engineered hydraulics. SuperFlo’s silent running capability and small footprint allow it to easily drop into a compact equipment pad. It is designed to mover more water more efficiently for lower operating costs and super-quiet operation. Through the efficient operational design, the SuperFlo pumps perform with less effort resulting in less wear and tear, meaning a longer life for a higher return on your pump investment. With a variety of horsepower options including single- and two-speed options, there’s a perfect match to your application and assurance of minimum energy consumption.